Scientists had already demonstrated that overfishing removes angelfish and parrotfish that feed on sponges growing on coral reefs—sponges that sometimes smother the reefs. That research was conducted off Key Largo, Fla.
Now, new research by the same team of ecologists suggests that removing these predators by overfishing alters sponge communities across the Caribbean. Results of the research, by Joseph Pawlik and Tse-Lynn Loh of the University of North Carolina Wilmington, are published this week in the journal Proceedings of the National Academy of Sciences . "In fact," says Pawlik, "healthy coral reefs need predatory fish—they keep sponge growth down." 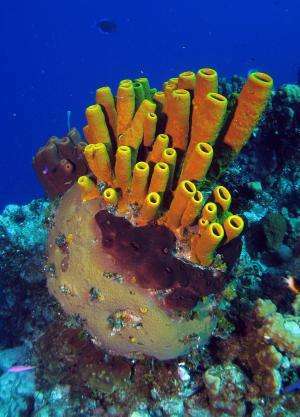 The biologists studied 109 species of sponges at 69 Caribbean sites; the 10 most common species made up 51 percent of the sponge cover on the reefs. 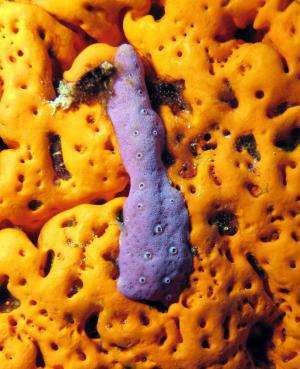 "Sponges are now the main habitat-forming organisms on Caribbean coral reefs," says Pawlik. Reefs in the Cayman Islands and Bonaire—designated as off-limits to fishing—mostly have slow-growing sponges that manufacture chemicals that taste bad to predatory fish. Fish numbers are higher near these reefs. Predatory fish there feast on fast-growing, "chemically undefended" sponges. What's left? Only bad-tasting, but slow-growing, sponges. Overfished reefs, such as those off Jamaica and Martinique, are dominated by fast-growing, better-tasting sponges. "The problem," says Pawlik, "is that there are too few fish around to eat them." So the sponges quickly take over the reefs. "It's been a challenge for marine ecologists to show how chemical defenses influence the structure of ocean communities," says David Garrison, a program director in the National Science Foundation's (NSF) Division of Ocean Sciences, which funded the research. "With this clever study, Pawlik and Loh demonstrate that having—or not having—chemical defenses structures sponge communities on Caribbean coral reefs." The results support the need for marine protected areas to aid in coral reef recovery, believes Pawlik. "Overfishing of Caribbean coral reefs, particularly by fish trapping, removes sponge predators," write Loh and Pawlik in their paper. "It's likely to result in greater competition for space between faster-growing palatable sponges and endangered reef-building corals." The researchers also identified "the bad-tasting molecule used by the most common chemically-defended sponge species," says Pawlik. "It's a compound named fistularin 3." Similar chemical compounds defend some plants from insects or grazers (deer, for example) in onshore ecosystems, "but the complexity of those ecosystems makes it difficult to detect the advantage of chemical defenses across large areas," says Pawlik. When it comes to sponges, the view of what's happening is more direct, he says. "The possibility of being eaten by a fish may be the only thing a reef sponge has to worry about." 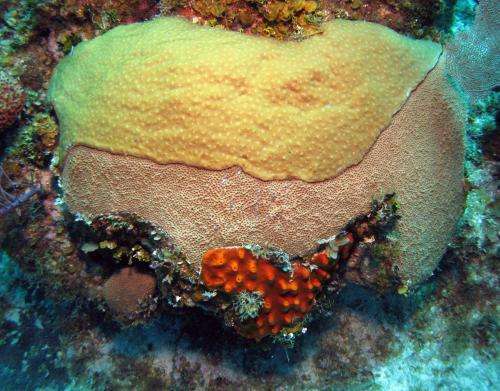 And what happens to reef sponges may be critical to the future of the Caribbean's corals.